During all my years of fishing and reading fishing literature, I only occasionally came across an article about fly fishing. In the area where I grew up, trout was almost unheard of, fly fishing even less. I used to marvel at the magazine pictures showing anglers dressed in fly vests and waders, casting this weird looking line in strange loops. When I went to university, I was in trout country, but still it was a past time of a select few (in those years) and it was not that easy to find a guide and mentor. Watching the movie “A River runs through it” , however, finally convinced me to take up this fascinating pursuit and the rest, like they say, is history. If you are just starting out at trout fishing, then you may be a little confused as to where to start. This is our basic guide on how to fish for trout in a pond or lake. In this article, we plan to cover a few of the basic areas of trout fishing. As with our other articles, the content is mainly aimed at novice anglers but anyone and everyone is welcome. Anglers are an opinionated bunch so feel free to mouth off in the comments below! Apart from the Atlas Mountains in North Africa, trout is not a native species of this continent. Brown trout was first introduced in South Africa by British colonists more than a hundred years ago in various locations and with varying success. At a later stage rainbow trout eggs (especially the Kamloops strain) was also imported from North America and successfully released into certain South African streams and rivers. Initially fishing for both these species took place exclusively in rivers. However, as years went by and certain big lakes and reservoirs were constructed for, mainly, agricultural purposes, both these species were released into these big bodies of still water where they thrived and prospered due to an abundance of food. Because trout need gravel beds with cold, running water in order to breed successfully, most of these still water impounds need to be stocked with fingerlings on a regular basis. In this article I will focus exclusively on the methods, tackle and strategy to hunt trout on artificial flies in these still water environments. I will also focus mostly on rainbow trout, because they are much more prolific than the elusive browns. The essential gear for catching trout on a fly consists of a fly rod, a reel and fly line. Fly rods are categorized based on a weight system, with a zero weight being a light, wispy affair designed to pursue the inhabitants of small streams and creeks and a 13 weight rod able to subdue powerful marine species like trevally, barracuda and even sail fish. Still water fishing requires rods ranging between 4 and 8 weights. They will do the job just fine. There are basically three types of fly line to choose from – floating, intermediate and sinking lines. All three types of fly line can be successfully employed on stillwaters, depending on the specific circumstances and conditions. Choosing a reel to match the rod is, again, a matter of choice. Make sure you use a line matching your rod weight and that your outfit is balanced. This can be ascertained by applying the simple test of placing the rod on your index finger just in front of the reel filled with line. If the balance is right, the rod will remain in a horizontal position. An essential piece of equipment is a good quality fly vest with multiple pockets. This enables the angler to have his flies, tippet material, floatant, scissors etc. within easy reach. Also handy on most stillwater lakes is a pair of quality waders. Not only do they allow you to gain that extra meter or two in casting distance, they also can assist in safely landing a big fish by guiding it into a net after entering the water. A pair of polaroid sunglasses are also non-negotiable in order to reduce the sun’s glare on the water surface. Because a fly angler has the option of different types of fly lines, they can employ different tactics and strategies depending on the line they are using at any specific time. Sinking lines can vary from slow to intermediate to fast sinking. If you are exploring relatively deep water (about 3 meters and deeper) a fast sinking line would be the best way to go in order to get your fly quickly to the desired depth. The name says it all – it floats. Ideal for using dry flies or small nymphs and emerger patterns. As far as control over the fly pertaining to speed of retrieve and/or imparting movement to the fly, the floating line gives one more leeway than the sinking variant. When approaching a large body of water for the first time, one has to constantly keep in mind the underwater topography and try to find ways of gaining knowledge about these underwater conditions. Anglers fishing from any kind of platform (eg. boat, kayak) can enhance their chances greatly by employing a fish finder or any similar kind of device to read the underwater scenario. However, most casual anglers are confined to the banks and have to try and get as good picture as possible of what is going on under the surface. Following the contours of the surrounding area and extending them in your mind’s eye as they disappear into the water is one of the methods for make educated guesses. That will give you some idea of the underwater topography, thereby focusing your attention on the most likely spots where to find fish, preventing you from wasting time on unproductive spots. The three main areas to focus on are: 1) Any inlets of rivers, streams, and little creeks entering the lake, 2) deep water spots close to the shore and 3) shallow water areas with aquatic vegetation. As a rule of thumb, I will normally fish the deeper areas during the day while concentrating on the shallow areas at dawn and dusk. During the daylight hours, especially on bright, sunny days (the norm in South Africa) trout tend to move to the deeper spots. The reason for this is twofold. Firstly, it offers more protection than shallow open water and secondly the water temperature is markedly lower compared to shallower spots. Trout, being a cold water species, therefore prefer to hang out in these places during aforementioned conditions. It does not mean that they will stop feeding, though. Not only does this present excellent feeding opportunities for hungry trout, the low light conditions also embolden them to leave their deep water sanctuaries in order to actively hunt in the shallows. As a first rule, one has to keep in mind that trout in big bodies of water, can grow to a considerable size due to the feeding opportunities presented to them. Because they have access to relative big food items such as crabs, frogs, big dragonfly larvae and small fry, one has to have fly imitations of substantial size to imitate these prey. 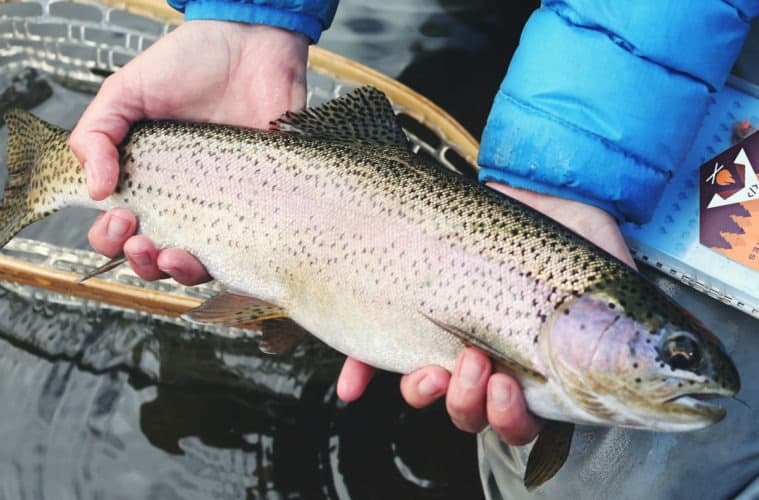 However, big trout still feed on small aquatic insects when the opportunity presents itself, and many an angler tend to forget this in their quest for that big, trophy fish. Whereas small streams and creeks may limit one’s fly choice to more diminutive patterns fished on a floating line, lake fishing opens itself to many different combinations and strategies. As a result of the normal dynamics pertaining to big trout lakes, I prefer to arm myself with a sinking line during the daylight hours and focus my angling efforts on the deep water spots. As for flies a selection of wet flies, streamers and big dragon fly patterns are high on my priority list. Flies like Woolly Buggers, Mrs Simpsons and big Walker’s Killers prove to be quite effective under these circumstances with sizes ranging between 2 and 8. The ability to cast a long line and a pair of waders come in quite handy in order to get close to your quarry. After a cast has been made, allow the fly line to sink down to the desired depth before starting the retrieve. This will obviously depend on the type of sinking line you employ. Try to figure out at what rate the line is descending (how many seconds per meter) and check the time to get a rough estimate. A lot of times anglers do not allow for enough sinking time and, as a result, are fishing much shallower than imagined with poor results. Try and vary your retrieving speed in order to ascertain which retrieve attracts the most attention and remember when there is very little or no action to rather slow down than speed up. If all else fails, allow your fly line to settle to the bottom and start a slow, figure of eight retrieve, thereby imitating a creature crawling along the bottom. More often than not this will induce a surprise response. As mentioned, dawn and dusk are the times to focus all your attention on the shallow areas, but beware, the window of opportunity may be limited and the action can be fast and furious. So make sure that you have back up leaders and tippets at the ready to replace the ones getting smashed up by strong and hungry trout. A floating line with a leader of around a meter and a halve ending in a meter long tippet will suffice for these conditions. Make sure to use at least 3X tippet material, because the takes can be brutal and no one wants to replace terminal tackle during optimum fishing time in low light conditions. I prefer to use a non-weighted fly that slowly sinks to the bottom as it absorbs water. Retrieves should be short, jerky strips to imitate a water borne insect ascending to the surface in order to break through the film thereby entering the next stage of its life cycle. My favourite flies for these conditions are dragon fly patterns (olive or brown), Woolly Buggers (red/black) and emerger patterns in sizes 8 to 14. Because trout is commercially farmed all over the world, I assume quite a number of readers are aware of their eating qualities, whether you are a fisherman or not. I possess a little smoke box which is, arguably, one of the best ways to prepare trout within less than 20 minutes. However, few things can beat a freshly caught trout fried with butter and a bit of salt in a little cast iron pan on an open fire. Cooked next to the water while still reminiscing about the recent hunt, represents, in my opinion, fishing nirvana. Trout, rightfully, commands an elevated position as far as fresh water fishing is concerned for a variety of reasons. However, some people tend to give it a special (elitist?) kind of status for which I don’t care much. Having said that, I have fished for trout in some of the most beautiful places and this, combined with their unique attributes as well as abilities to test one’s angling skills, still makes them one of my favourite angling species.